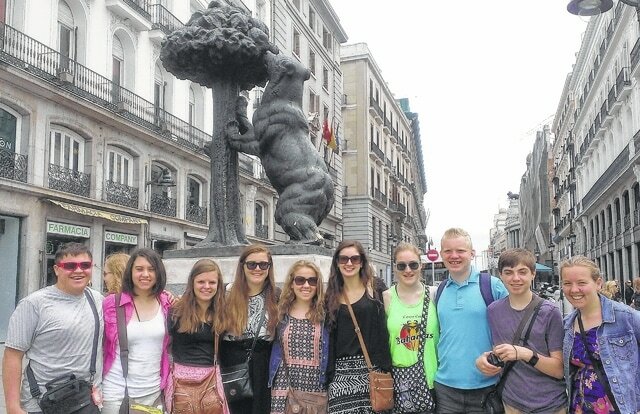 School may be out for the summer, but Big Walnut students still have a host of school-related activities in which they participate, like the Big Walnut High School Spanish club’s recent trip to Spain. Ten Spanish club members and Spanish language teachers Dora Riggs and Jennifer Zimmer toured Barcelona and Madrid earlier this month. The trip included tours of the Sagrada Familia and Park Guell designed by Antonio Gaudi, as well as time exploring Las Ramblas in Barcelona to shop, allowing students the opportunity to practice their Spanish language skills. Riggs said that, before leaving on the journey, students did research and made presentations about different locations visited during the trip. She said because students were familiar with the sites, they had a better appreciation for each day’s itinerary. Students who went on the tour were Campbell Allen, Rachel Brown, Mitchell Cholley, Erin Lanning, Maddie Jenkins, Mary Jenkins, Abby Kitchen, Selena McVay, Kate Petty and Sam Will.